Two women in their 60s, a Cambridge bicyclist and a Boston pedestrian, died Wednesday after being struck by large commercial trucks in separate accidents, authorities said. In Cambridge, Marcia Deihl, 65, was hit by a dump truck at about 1:30 p.m. as she rode her bicycle onto Putnam Avenue from the parking lot of a Whole Foods Market, where she had been shopping, authorities said. Deihl was pronounced dead at the scene, Cambridge police spokesman Jeremy Warnick said. The driver, a 44-year-old Medford man who was not identified, may not have immediately realized he had hit a person, but he stopped as soon as he became aware, said David Procopio, State Police spokesman. The man was driving for CJ Mabardy, a Cambridge excavation contractor, Procopio said. The driver is cooperating with investigators, according to Jacquelyn Goddard, a spokeswoman for Middlesex District Attorney Marian T. Ryan. 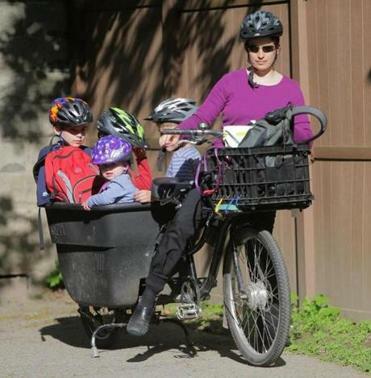 Cyclists in Cambridge logged 15.5 million miles in 2012, a 237 percent increase in mileage from 2004. Pete Stidman, director of the Boston Cyclists Union, said that as far as he knows, this is the first cyclist death of the year in the union’s area of operation, which includes Boston, Brookline, Cambridge, and Somerville. Stidman said roughly half of cyclist fatalities involve large commercial vehicles. For safety, the union recommends side guards on large trucks, and Stidman said all motorists should watch for bikers. “When you’re driving a car, you’re in a two-ton piece of steel, and that really requires a greater amount of responsibility,” he said. About an hour earlier in Boston, a 69-year-old woman was crossing Charles Street from the Charles/MGH MBTA station toward the Liberty Hotel when she was struck by a 32-foot tractor-trailer owned by Coca-Cola Enterprises, Procopio said. Eyewitness accounts and other evidence suggest that the woman, who was not identified, crossed against the light, according to Jake Wark, a spokesman for Suffolk District Attorney Daniel F. Conley. A nearby ambulance crew stopped to help the woman and took her to nearby Massachusetts General Hospital, where she was pronounced dead, Procopio said. He said the tractor-trailer driver, a 38-year-old Saugus man, immediately stopped and tried to help the victim, and later cooperated with investigators. “He showed no indication of alcohol or drug impairment, but he will have to submit to drug and alcohol testing per commercial driver’s license regulations,” Procopio said in an e-mail. Investigators will also examine the driver’s cellphone, video from surveillance cameras, and the tractor-trailer’s mechanical systems, Procopio said. No charges have been filed, and State Police did not hold the man, he said. Globe correspondents Rebecca Fiore and Aneri Pattani contributed to this report. Jeremy C. Fox can be reached at jeremy.fox@globe.com.